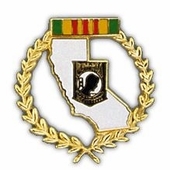 Our California State Vietnam POW/MIA Wreath is a 1 1/4" hand enameled, gold plated, cloisonne pin and is the same pin that is sold in Military Base Exchanges around the world. This pin works well as a hat pin or lapel pin and will look great on your Military Veterans Ballcap or Veterans Service Cap, and is a an excellent way to remind others of those who have made the ultimate sacrifice. This pin would be a great gift idea and a wonderful addition to your pin collection.